Most individuals keep a bottle or two of Coca-Cola at the ready in the refrigerator to satisfying their cravings for something sweet or to quench their thirst when the temperature gets over 90 degrees. But now there is a video making the rounds online in which a young woman shares a terrific tip for another use for Coca-Cola. This carbonated beverage makes a great substitute for toilet bowl cleaner. It's also a great way to use up any soda that's been left in the bottle. The reason that Coca-Cola works so well at eliminating toilet bowl rings and lime scale stains is its high acidic content. The young woman in the video grabs a partially full bottle of Coca-Cola and her toilet bowl brush and gets to work. She pours the soda into the bowl, gets busy with the brush scrubbing away at any rings or debris attached to the porcelain, then pushes the handle to flood the bowl with clean water which helps to flush the soda and stains completely away. 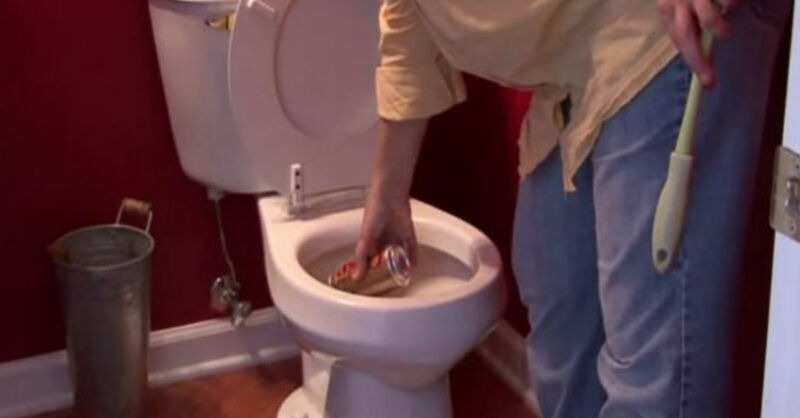 Not only is this process quick, easy and inexpensive, the young homemaker reminds her audience that soda makes the perfect toilet bowl cleaner substitute for those times when you've run out of your regular cleaning supplies and haven't had the time or energy to get to the grocery store. Simply grab a bottle or can of Coke from your refrigerator and the yucky job of cleaning your toilet is already half done.